Discussion in 'The Pub' started by GuitarKidd, Apr 27, 2016. This is what it looks like (Sorry, didn't take pics last night so not the actual car). I'm very impressed by this car. I think it's very good looking and Honda did a fantastic job in making a car I would want to drive. It has that fastback aggressiveness to it that I find appealing. So how's it drive, not like a Civic at all! The EX-L comes with the 1.5 liter turbo charged VTEC that is quick and has enough torque to push you into your seat. I think it's rated at 178 hp. There is that slight lag from a stopped position, but when the turbo kicks in and you keep the turbo winding up you forget it's a 4 cylinder engine and start paying attention to what is happening on the road. Car & Driver said they clocked it at 6.8 seconds from 0-60. Granted, that's not mind blowing, but remember, it's a Civic! You can drive in 3 modes. Economy, normal, and sport. In sport mode, the Civic keeps the car's RPM's up and the Turbo spinning for at-will torque. We have a 2.5 liter Mazda CX-7 and there is no way in hell it will keep up with the Civic, not even close and the Mazda is a fun crossover SUV to drive. It is also very comfortable. The EX-L has leather appointments and front heated seats. The seats are very comfortable. I'm 260, and feel right at home. It also offers plenty of leg room for a taller driver. The back seat isn't huge, but there is plenty of headroom for most riders. Technology at this point in cars is astounding and the Civic has loads of it. Everything now is touch screen. There are very few "buttons" and dials. The car has Apple Car Play or Android Auto, just plug in your phone of choice and it automatically recognizes the type of phone. You then can make calls, texts, get directions and use the built in GPS all hands free. The touchscreen is very nice and works like most tablets. One con I do have is I wish there was a volume knob. Instead there is a dedicated volume slider that you slide your finger up and down on, or, you tap the + or - symbols to adjust the volume. The steering wheel does have a volume control which I find easier to locate when driving. Bluetooth is of course there along with, HD radio, satellite, etc., But there are a ton of other features. In fact, you can download apps to the car if you connect it to WIFI (Which I haven't tried yet). I'm going to try and get some pics of it later today, but I had a few minutes this morning to share. soulohio and derekd like this. I'm on my second Civic now (first was a '97, now on an '07) and this one (yours) has really got it going on. There was a time when Civics looked like smaller versions of the Accord (for the most part), and this one has that in spades. Actually, it looks more Acura-esque than previous Hondas, especially that profile. I like that car it's so nicely put together. Call it Susan. Sorry wrong thread. It's probably made in Canada. Can't go wrong with a Honda Civic ! GuitarKidd and derekd like this. Much better looking than the Civics I'm used to seeing. Gives me another car to check out when we go looking next year. I just traded in my 2007. Was a bit ambivalent about it because they are so well made. In the end, it was squeezing my 6'6" frame in and out that was the deciding point. I wish you luck with it, but I doubt you'll need it. My daughter just bought a used 2013 and she's delighted. IME last forever and a day. Agreed, I think they have an Acura-esge look to them. If we would have went with the Touring option, you get front LED headlights that would have really made it look like an Acura. I'm thinking that when the new Accords come out, they will have styling like the Civic, just a bit bigger. This is actually our second Civic. We had an 05, but out grew it and traded it in on a used Town n Country. We really liked our old Civic and never had any issues with it. 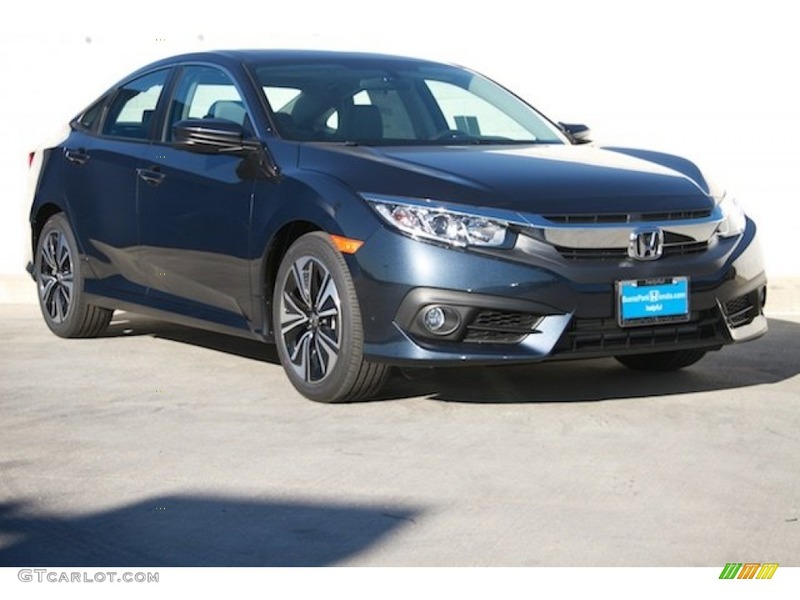 We definitely wanted another Honda and the Civic with it's gas mileage and performance just won us over. From what I have read, they will be releasing a hatchback version, a 6 speed manual in the Turbo version (Manual only available in the 2.0 non-turbo version) and the new SI will be coming out. It will be interesting to see what they tweak in 2017. I've been meaning to go and look at one of these....I have a 2008 Civic that I bought new...it now has 154,000 miles on it....everything still works the same as it did when brand new.....filled up the other day and checked my mileage....36.9 MPG. No complaints from me.....and the next car I buy will be another Honda....maybe even a new Civic....although I've been eyeballing a Honda Pilot too. Those new Pilots are nice. The new HRV is slick too. Nice!! I'm literally sitting at the Honda dealer getting our crv oil changed. I had a 2014 si which was an absolute blast- but my back can't handle how low it sits. Amazing resale, mileage, and just straight fun! Congrats! Nice car. And yes, Honda makes a GREAT product. The technology loaded into new(er) cars is just insane. New world problem with new cars: Everything on my car is automatic. Set lights, wipers to automatic and they come on when they're supposed to without driver intervention. First time in the car wash, I couldn't remember how to turn OFF the windshield wipers. DOH!!! I parked next to one recently, they're sharp vehicles. Could probably outrun my '09 Accord with the 4 cylinder. That Crosstek is not looking ride. If you like that you might want to check out the new Honda HRV. That is a sharp ride too. When I replaced my 1996 Civic EX, I got a 2011 Civic Si and I love it 5 years later (gas milage is poor vs the standard Civic, though). My wife just got a new 2016 Honda HRV last week and she's very happy with it. It can hold a lot of stuff for a pretty small "compact utility vehicle." I hadn't even heard of the HRV until this thread. That is a good looking crossover. Wil have to compare to the CX5 from Mazda, though I'll be surprised if it handles as well as the Mazda.